Navy Counselor 1st Class Luis Diaz, from Victorville, Calif., high fives a student during a community relations event at Wettengel Elementary School in Guam. Providing a combat-ready force to protect collective maritime interests, Stennis is operating as part of the Great Green Fleet on a regularly scheduled Western Pacific deployment. 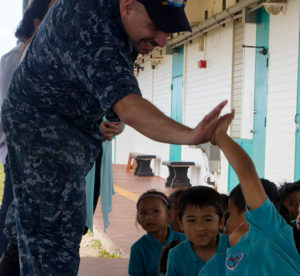 DEDEDO VILLAGE, Guam–Sailors from USS John C. Stennis (CVN 74) participated in a community relations (COMREL) event at Wettengel Elementary School in Dededo Village, during a port call. Throughout the day, Sailors were greeted with “Welcome to Guam!” and “Hafa Adai!,” the Chamorro phrase for “hello,” whenever they entered a classroom. Sailors played with the children, assisted the teachers in their lessons, painted walls and explained to the students what being a Sailor is like. The children surprised some of the Sailors, bombarding them with questions and stories that showed a relatively high level of understanding about the Navy and Marine Corps. Diaz described how while he talked to the kids about Navy life after playing with them. One little girl asked him about his family and if he missed them. “I had to pause for a second because I realized [she] was making me think deeper about this … and I told her that I did,” said Diaz. Cash said when Sailors would walk into a classroom the kids would flock to them. A little boy named Jimmy immediately wanted to spend time with Cash after they met. After recalling his day, Cash thinks he got more out of the event than he gave them. By the end of the day though, some the kids didn’t want to let the Sailors go. Cash and Diaz both feel there is a tremendous amount for Sailors to gain from participating in COMREL events. “I think Sailors feel very moved by the lives they are touching and [they] come away feeling like they’ve seen more of humanity than just going to bars or clubs,” said Cash. Providing a ready force supporting security and stability in the Indo-Asia-Pacific region, Stennis is operating as part of the Great Green Fleet on a regularly scheduled 7th Fleet deployment.